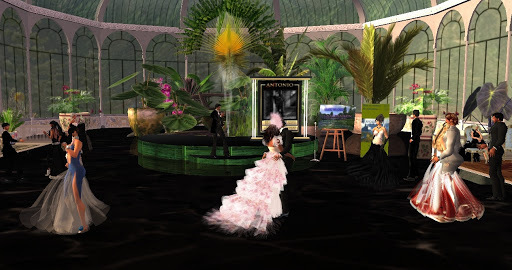 On Wednesday night, Taka and I dressed up and headed over to the Glass Pavilion at Calas Galadhon. Magi is now not only hosting but is in fact managing all the live entertainment at Calas. This is really a perfect fit for Magi because she has always promoted live performances in Second Life and now with the awesome venues of the Calas sim group she has many themes to work with. Naturally, the handsome and wonderful duo, Ty & Truck, were there. The evening’s performer was Antonio Galloway, a baritone with an enchanting repertoire of songs from Broadway to jazz to pop. 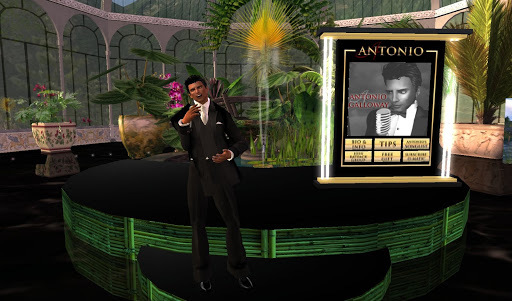 Anthonio filled the pavilion with his perfect baritone voice; truly one of the most polished professional performers I’ve heard in Second Life. Ever gracious Magi welcomed guests into the Pavilion that Ty & Truck built with such care. A lovely group of people, a romantic evening and yes, that’s me showing off in the center in my pink feathery Paris couture gown. NEWS ALERT: I just discovered that there is a Calas Galadhon blog! I’ve added it to the “Special Interests Blogs” collection in the right column of this blog. This entry was posted in Events and tagged Nightlife, Photography, Second Life. Bookmark the permalink.